The Coalition of African Lesbians (CAL) invites its members, partners, allies, friends and fellow feminists to participate in a conversation on Abortion & Autonomy: Demanding full control over our bodies and our lives. The Coalition will be hosting this conversation as one of our actions towards recognizing, as well as mobilizing thought, action and ideas towards the Global Day of Action for Access to Safe and Legal Abortion on September 28. Initially known as the September 28 Campaign, this initiative was a regional campaign for the decriminalization of abortion in Latin America and the Caribbean for over twenty years before being taken on by Sexual Reproductive Health and Rights (SRHR) activists all over the world in 2011. Last year, CAL hosted a twitter conversation that focused on the demand for the involvement and commitment of States as well as Civil Society in Africa in ensuring safe, stigma-free, legal, affordable and accessible abortion services. 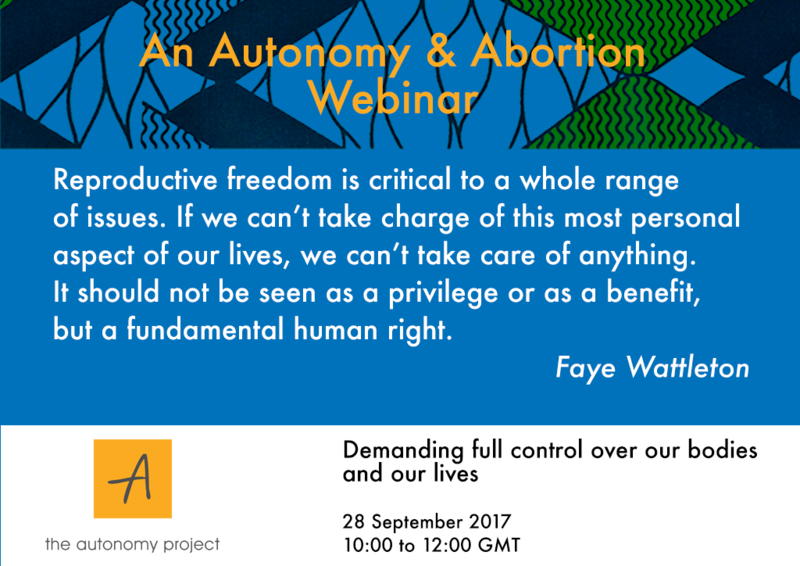 This year, CAL continues this call, with a conversation that delves into our ongoing demand for the bodily autonomy and freedom of women, and how access to safe abortion is a pivotal ask in this demand. This webinar is an important call for engagement at a time of rapidly shrinking civil society for organizing, in both regional and international spaces. Dwindling financial and human resources and political will to engage in spaces and convenings in Africa mean that fewer organisations are able or even willing to do this work. The influence of a number of global North countries that have elected conservative governments continue to bar substantial resource allocations to the continent for work that supports comprehensive sexual and reproductive health services; which includes work around abortion services. Despite this increased pull towards conservatism, other States have stepped in to fill this void. These efforts, while commendable, remain insufficient to meet the already overwhelming effects of illegal or unsafe abortions and denied post-abortion care. Women’s bodies and reproduction remain a site of control and regulation in Africa and the rest of the world. This denial and forceful suppression of bodily autonomy remain deeply entrenched in various interpersonal as well as structural patriarchal frameworks. Women are considered second class citizens and denied the right and opportunity to make informed decisions about their lives and about their bodies. The role of religious institutions as influencers of the State and in society cannot be overlooked, as they are key agents of continued conservatism and advocates for the subjugation of women. The taboo nature of abortion is also a primary deterrent for activists and lawmakers alike, who distance themselves from naming abortion as pertinent to the realisation of women’s human rights. Consequently, there is a reluctance from these activists/lawmakers in and demanding that abortion access becomes legal and available to women. Up-to-date and easily available information on abortion in Africa remains scarce, even in contexts with legal provisions for abortion, they are disregarded in favor of more conservative and oppressive practices or ideas around abortion. Lack of comprehensive sexuality education, lack of access to legal and social support, the absence of facilities and political will, are some of the issues that force women to seek illegal or unsafe abortions.